on major sites, gets all the traffic, and sells out fast "
Get Hashtag PRO now for $149! Watch engagement explode on your posts because sites like Buzzfeed featured your content!
" 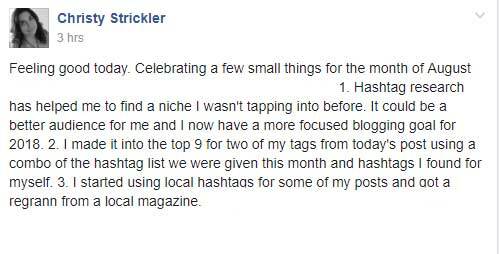 ... they found me through my hashtags"
"I really wanted to increase my local presence ... she told me which hashtags to put in my post to get local attention. Since I've been using hashtags more strategically, my Instagram account has been growing organically. A talent scout for a national art show found me through my hashtags and asked me to be in a local art show! It was an AMAZING experience. They've now invited me to show my work at their largest shows in LA and NYC!" Put the power of hashtags to work for you. Hashtags are part of pop culture but they have a secret super power to attract the right customers to your business and so much more. What if you had a secret weapon that helped you STAND OUT from the competition? There is a reason why some people's content gets featured on major sites, gets all the traffic, and sells out fast ... and hashtags are a shortcut to get there. There is a hashtag SECRET no one is talking about. ... and it's using hashtags on Pinterest to get MASSIVE TRAFFIC to your site. What if you knew how to use hashtags on Pinterest like a PRO, before everyone else figures it out? Discover how to make hashtags your SECRET weapon! 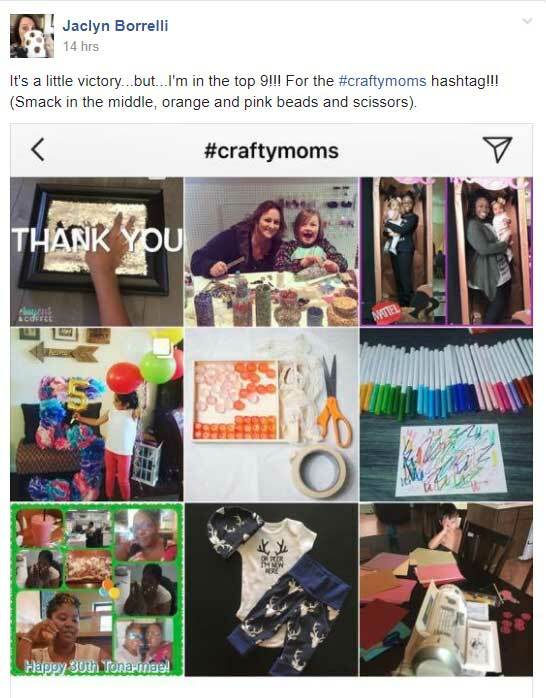 "After taking the Hashtag Pro class, my posts are doing so much better." "I've been struggling with my engagement on Instagram and after taking the Hashtag Pro class, my posts are doing so much better. The strategy that Jennifer lays out is doable and easy to understand. She explains exactly how to find the hashtags that make sense for your content and gives you actionable steps to creating a hashtag strategy that will help your account and posts to be found on Instagram! 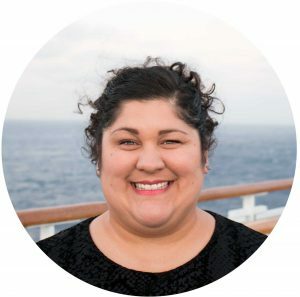 Jennifer is up on all the current algorithm changes and I love her straight forward approach to teaching others about social media. If you've been struggling with reach on Instagram you should definitely check the course out!" 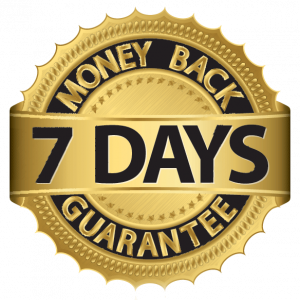 You are fully protected by our 7 Day Money-Back Guarantee. If you don't love Hashtag PRO in the next 7 days, just let us know and we'll send you a prompt refund. "... my website clicks are up 400%"
"As a solopreneur I struggle with keeping up on all my social media channels. I've always enjoyed Instagram but had been just randomly posting whenever I thought about it. Jennifer shares lots of helpful ideas on scheduling, finding our own hashtags, and how to keep them all organized! I just checked my IG stats and after 2 months of following the Hashtag PRO recommendations: my impressions are up 220%, reach is up 125%, profile views up 175%, but best of all my website clicks are up 400%! " I'm struggling to grow my following on social media. How can Hashtag PRO help? Hashtags provide a way for people who don't even know you exist to find you and connect with you for FREE. Hashtag PRO will show you how to use hashtags as a targeting tool, research tool, and content development tool to get attention on social media without spending any money on ads. I don’t have an Instagram account … should I wait until I have one set up? You absolutely do not need an Instagram account! 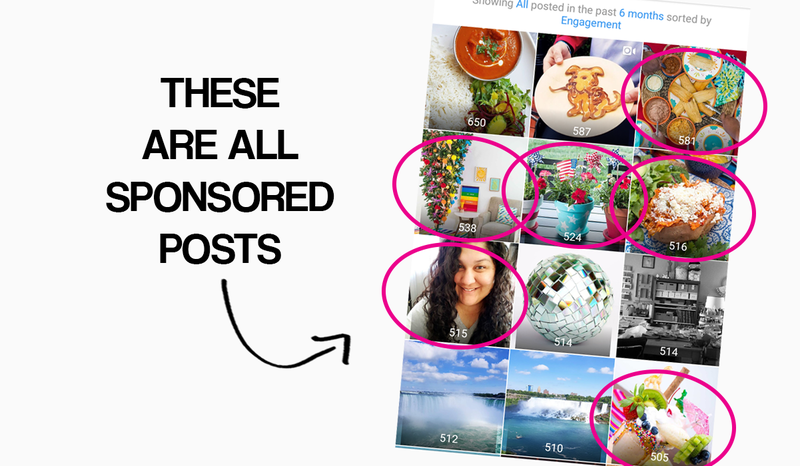 These strategies work whether you use them on Instagram, Pinterest, Twitter, YouTube, Facebook…or anywhere else. I've taken other courses and haven't seen results. What makes Hashtag PRO different? In Hashtag PRO I not only help you learn what to do and how to do it but I explain the WHY. The WHY is what truly empowers you to apply the strategy to YOUR UNIQUE BUSINESS. 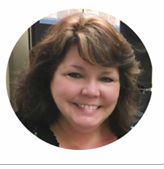 I'm here to help you every step of the way through the course and in our Facebook community. What if I'm not a "crafter"? What if my business is in another industry? That’s totally okay!! I’ve seen the Hashtag PRO strategies work across a number of niches and businesses-it’s all about understanding how to leverage them for your business. Hashtag PRO covers the same strategies I've used for clients in all sorts of industries from big box wholesalers to online retailers, from bloggers to etsy shop owners, and from artists to small business owners. I don’t have any pages yet …will this help me get started? No pages at all? If you don’t have a social presence this is probably not the course for you. I’m not a business, but I want to be able to find things that are relevant to my interests …will this help? YES!! Regardless of your niche and interests, you’ll be able to navigate social media SO.MUCH.FASTER. using these strategies. What if I find that I don’t like the course? We hope that doesn’t happen, but if it does, we have a 3-day or 3 lesson refund policy, no questions asked. How long do I have access if I buy the course now? You get access and updates for at least one full year. ​But what if I heard hashtags are dead or don't work? Hashtags are alive and well, despite popular doomsday rumors. In September 2017, Pinterest changed it's entire search capabilities by adding hashtag functionality; now users can search keywords AND hashtags on Pinterest and get incredibly accurate results. In early 2017 Instagram invested heavily in improving it's hashtag infrastructure for user experience and to combat the bot problem. Two years ago, Facebook made a huge deal about making hashtags clickable on their platform ... why would all of these huge companies invest in creating a BETTER hashtag experience for their users? Because they understand the power and potential of hashtags from the perspective a good user experience. In short, that means if you have a great hashtag strategy, you're playing the social media game like a master. Like a PRO! Hashtag PRO can get you there. "After joining Hashtag PRO, my followers increased 30%, by nearly 1000. My impressions went up by 40% in the past 90 days by applying what I've learned in Hashtag PRO! If you are looking to grow your Instagram, I highly recommend joining!" There's so much advice about hashtags out in the market. I've seen experts share ideas that sound logical and smart on the surface. Ideas like copying and pasting hashtags from industry leaders or using the most popular hashtags in your niche. Maybe you've tried hashtag strategies before and when they didn't work, you thought that hashtags were the culprit. The reality is that the copy and paste strategy doesn't work. Many of the strategies you'll find for free online are out of date or simply don't go deep enough. And that's because there's a lot MORE to consider than popularity when choosing hashtags. In Hashtag PRO, I walk you through the EXACT strategy to follow to help you find quality hashtags in your niche. Hashtags that give context to your content or product. Hashtags that will help you get attention from the RIGHT customers. I explain how to use hashtags on EVERY major social media platform and share hacks that the experts don't want you to know. I also help you organize and store these hashtags so that you can easily access your lists any time or pass this task off to a staff member or VA.
Then I go BEYOND using hashtags on social media posts. I share ways to use the hashtags you've already researched to explore the competition, identify trends, and find ways to make better content and a better product so you can stand out above everyone else. Not only will you get the attention you want by using the strategies in Hashtag PRO, you'll be creating content (or a product) that eclipses what everyone else is doing. Click the button below to sign up to get access to the Hashtag PRO course. Master hashtags and beyond! "Hashtag PRO Club has helped my Instagram growth"
"With all of the algorithm changes, I was having a hard time gaining new followers. After joining the Hashtag PRO Club I have a steady gain of new (true) followers. The hashtags we receive in the Club are well researched and planned, and I love having the the “Special Days” list for the month. It's easy to use, just copy and paste! The Hashtag PRO Club saves me time. I know I can pull from the list without needing to spend valuable minutes or hours researching if a hashtag has been banned, or if it has high competition. The Hashtag PRO Club is a valuable, time-saving resource for anyone that is working on growing their Instagram influence." In case we haven't met yet .. I'm truly invested in helping you become a Hashtag PRO. I've been in your shoes before. I tried using free hashtags lists. I bought lists from other people who said they were "experts". 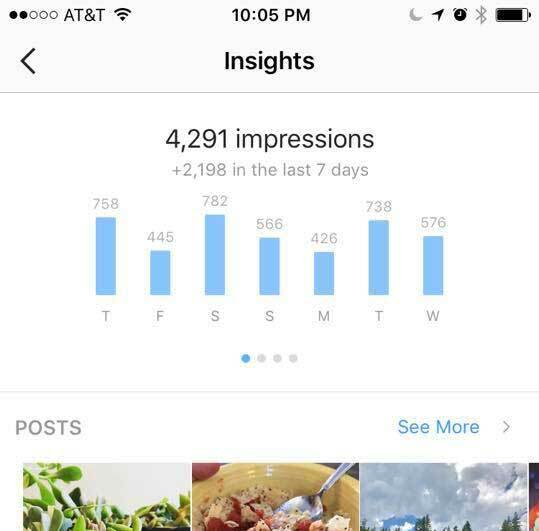 I went to conferences, took courses, and even tried using bots to grow my Instagram following. I got tired of being taught strategies that worked two years ago ... 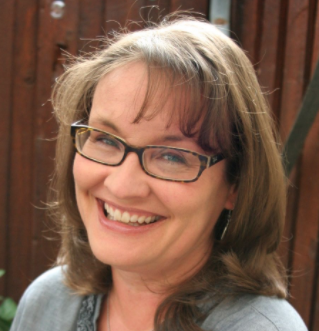 I got tired of learning strategies that didn't apply to my niche ... I got tired of people telling me the steps they took to get success but not explaining how or why the strategies worked ... I got tired of using "shortcuts" that weren't sustainable in the long run. So I set out to find a solution. I was not only working on my own Instagram accounts but I was managing accounts for several brands, all with different products and different sized followings. I tested the strategies I discovered on my own accounts first. Then I validated the strategies on my clients' accounts. You might have seen the rainbow felt letter board in the screenshots I shared above. I wanted a felt letter board really badly but they were super expensive. As a craft blogger, I decided to DIY my own letter board. I used super secret hashtag research techniques to figure out what was missing in that market and to identify customer needs. And then I created my content ... content that not only filled a need in the market but stood out visually from everyone else. 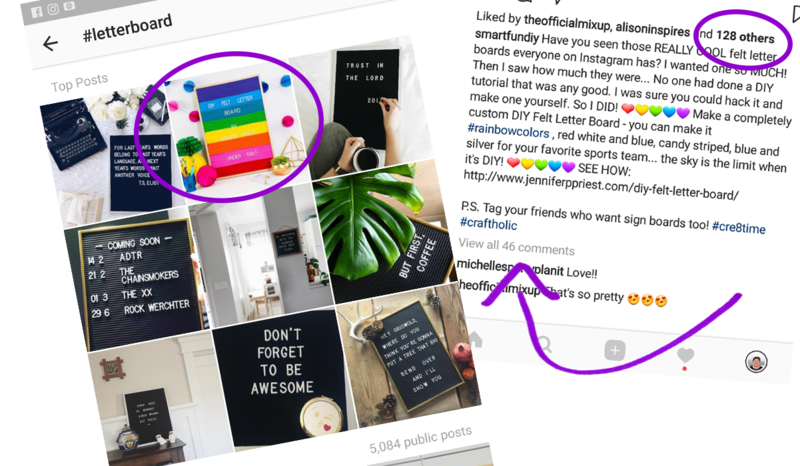 That letter board not only dominated the search results on Instagram for MONTHS but it has inspired brands to expand their product lines to include colorful letter boards. Even an Alibaba seller is trying to sell knock-offs! You can't go on Instagram without seeing colorful felt letter boards today. Talk about being ahead of the trend ... don't we all want to be "trendsetters"? And the examples don't stop there. I've been able to replicate results like this over and over for myself and my clients. People started noticing my success. They knew that success didn't just happen because I was "lucky". And they started asking me to help them. I could give a few pointers while on a coaching call or through a DM but there was so much more I wanted to share to help other business owners take their hashtag game to the next level. I started offering the highly researched, targeted hashtag lists I had created for our agency, through the Hashtag PRO Club. I shared a few training videos to get everyone started but there was still more I wanted to share. That's when I created Hashtag PRO. The experts aren't talking about any of the next-level secrets I share in Hashtag PRO. These strategies work for EVERYONE and in EVERY industry to help you get the attention you want from the right people. 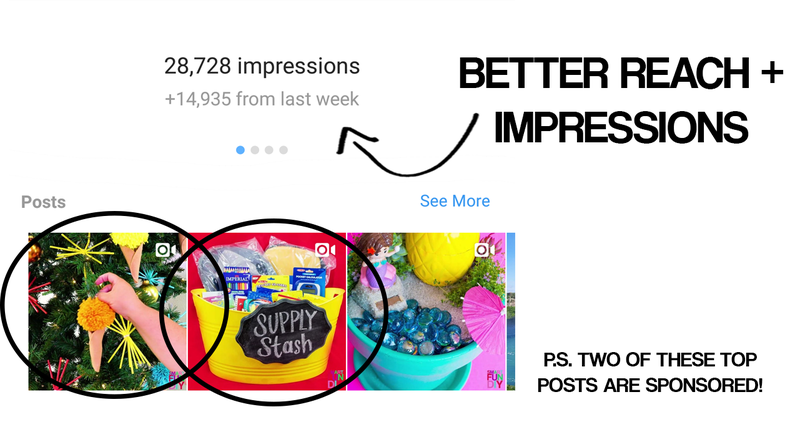 Whether you use Instagram or not, whether you use Pinterest or not, you can use these strategies to improve your product, content, or service in ways that will blow your mind! In Hashtag PRO, the first lessons just barely scratch the surface of hashtags. We start with the basics of what hashtags are and how they work on each social network. Then we deep dive in the next 3 modules into how to find the BEST hashtags for your content and niche, how to use hashtags for research, and how hashtags can pre-charge your post's success. The biggest mistake you can make in social media is to move forward without a strategy. I know you will love what you find in Hashtag PRO. That's why I am offering a 7 day money-back guarantee. If you get in the course and decide it's not for you, simply email me and I will send a prompt refund. I haven't had to refund any one yet but if you're not happy, I want to make it right. "ANYONE can use the strategies in Hashtag PRO ... when you have the tools and the understanding to implement hashtags for YOUR UNIQUE BUSINESS you will see results over and over again. It's not magic ... just solid strategy"